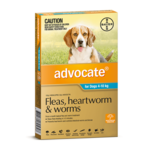 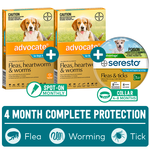 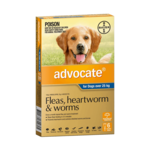 With each easy to administer, monthly spot-on application, Advocate offers reliable and convenient protection for your dog against fleas, heartworm, major intestinal worms and ear mites. 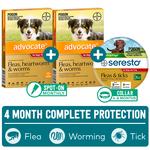 Advocate is water resistant after application and safe to use in puppies from 7 weeks of age, so you can be sure your pup is protected against deadly heartworm and other nasties right from the start. 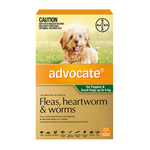 Advocate stops fleas feeding within 3 to 5 minutes, and kills adult fleas and their larvae within 20 minutes, essentially breaking the flea lifecycle. 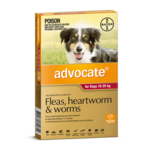 With monthly use it also protects your dog from the danger of heartworm infections.